Every so often there’s an article like this one in today’s Guardian, about “twins” born years apart… The writer of this piece has a son and daughter born as a result of one fresh IVF cycle and a further frozen embryo transfer from the same batch of embryos. 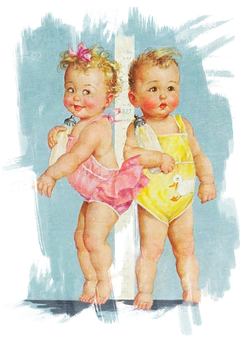 It is a fortunate, yet far from uncommon, experience after fertility treatment, but it doesn’t make the children “twins”. Twins are two babies who are carried together and born at the same time, which these children were not. They are siblings rather than twins. The Guardian seem to specialise in this myth – here are some previous twins who were born five years apart, although at least that time they called them “twins” in the headline… Those were also covered by the Telegraph. And unsurprisingly the Daily Mail likes them too – these brothers born two years apart are “technically” twins according to the Mail – in fact, they are technically not twins. It is always made to sound as if it is some extraordinary and highly unusual matter, yet there are hundreds of thousands of siblings around the world who will have been conceived in a similar way. This entry was posted in fertility, IVF and tagged Daily Mail, frozen embryos, Guardian, infertility, IVF, Telegraph, twins by fertilitymatters. Bookmark the permalink. Exactly what I thought whenI read the article Kate. These children are NOT twins. Completely agree, as we discussed beneath Sarah’s post on FB! Thanks for taking the time to read it and comment Jim! I couldn’t agree more! This Guardian article also jarred with me. I am expecting my first through IVF, and have seven embryos from this round in the freezer. I almost don’t even consider them all to be siblings, let alone octuplets!! IVF isn’t that good! Thanks Hannah for taking the time to comment – and congratulations too! I see it exactly the same way that you do – I’m not quite sure where this “twins” idea comes from at all. Is it something that comes from journalists misunderstanding things or is it from patients or from clinics?